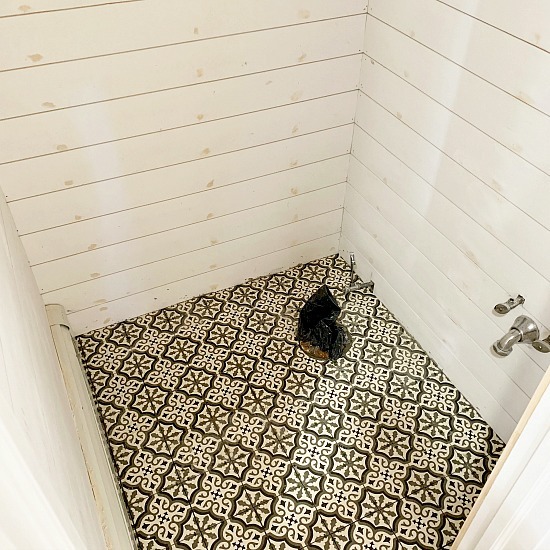 It seems my house is full of small bathrooms and one by one we've been renovating them. 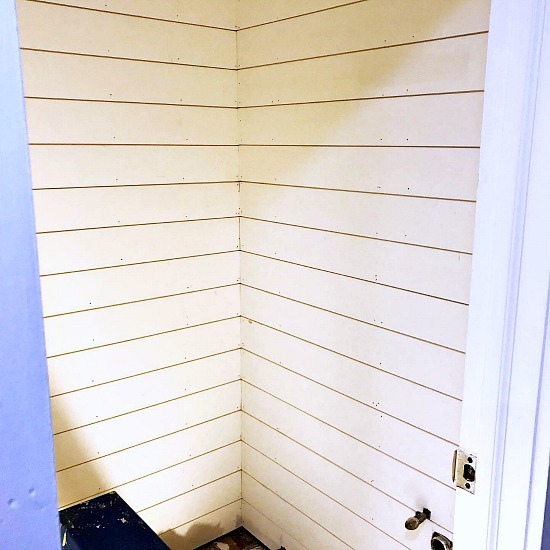 This one is the smallest and actually got smaller when we removed the white paneling and added shiplap. 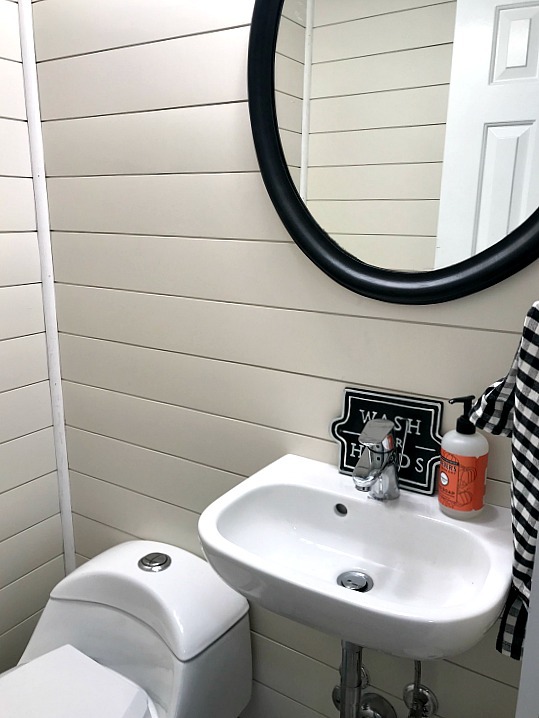 The shiplap is about 1/2" thick so add that to 4 walls and this bathroom is now almost big enough to turn completely around. 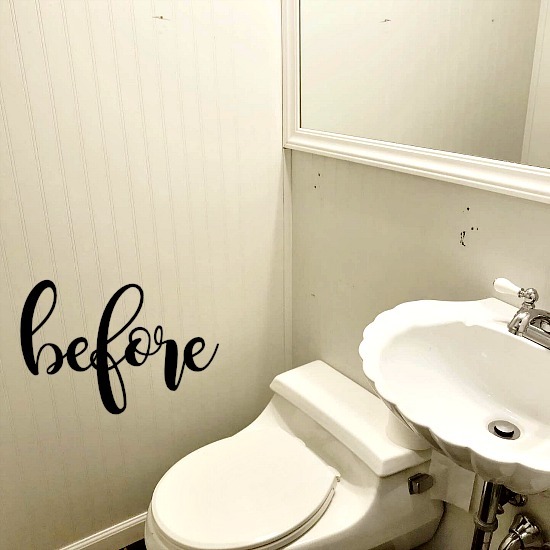 The toilet and seat were cracked and as large as a big mirror makes a small bathroom look, there is NO reason you should ever want to see that much of you! 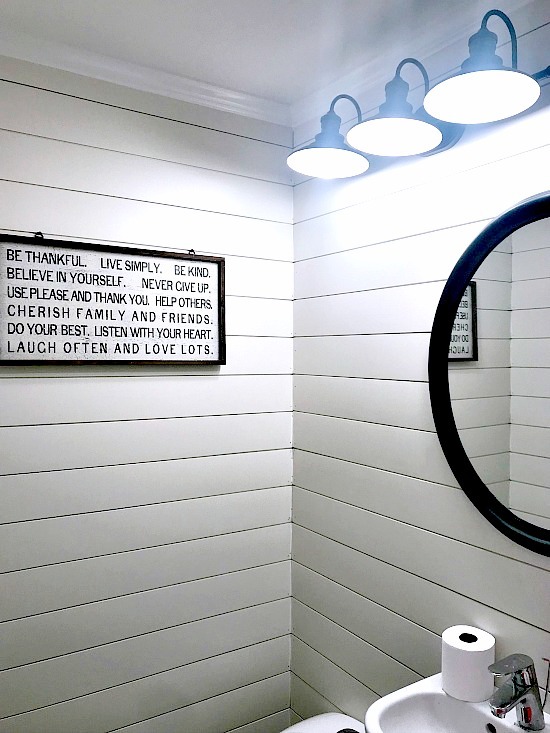 Everything came out and the shiplap went up. 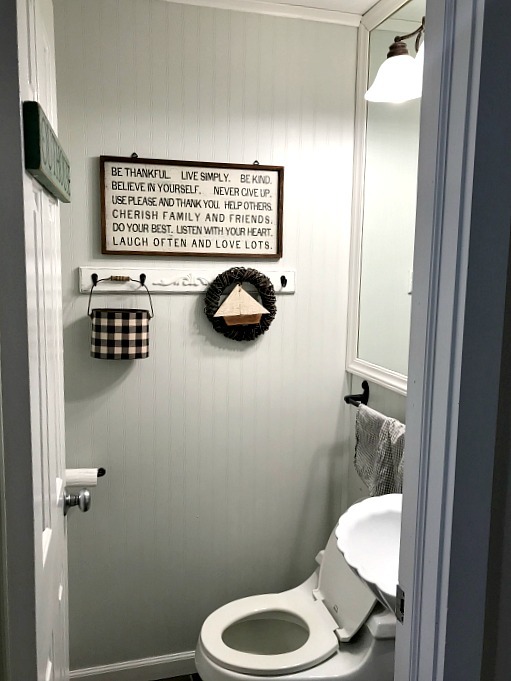 We used 4" tongue and groove shiplap boards from Home Depot. I went with the narrower boards because of the size of the bathroom. When I say "I" I really mean we... I was lucky enough to marry off my 2nd daughter to a good looking contractor. 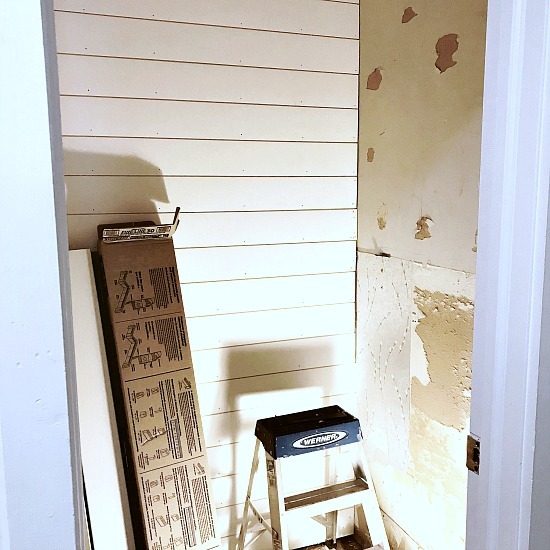 The shiplap was nailed up then they filled in the holes and painted the walls with Benjamin Moore's Ballet White. Ballet White is the color I used throughout my house. 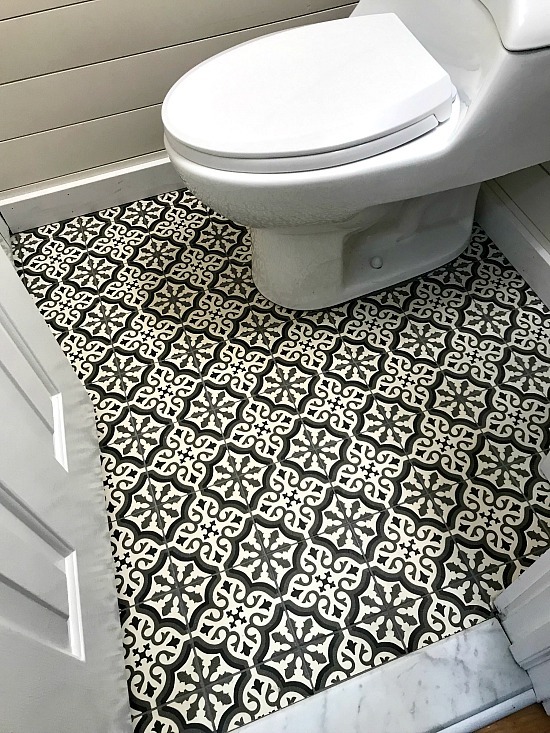 For the floor, I chose an inexpensive 4" square tile from Lowes and I couldn't love it more! We replaced the old baseboard with a shiny new one. Quarter inch round trim finished off the corners, straight trim on the floors, and crown molding for the ceiling. For the lighting, we went with a three shade farmhouse light similar to this one. I found the one we used at Lowes. We chose a one-piece Swiss Madison dual flush toilet because of its great reviews and compact size. The old sink was originally a pedestal sink before the pedestal part broke... I'm not sure what went on in this bathroom but a lot of things were broken. The new sink is a small Duravit wall hung sink. I ordered it from Amazon. You can find it by clicking on the orange link. 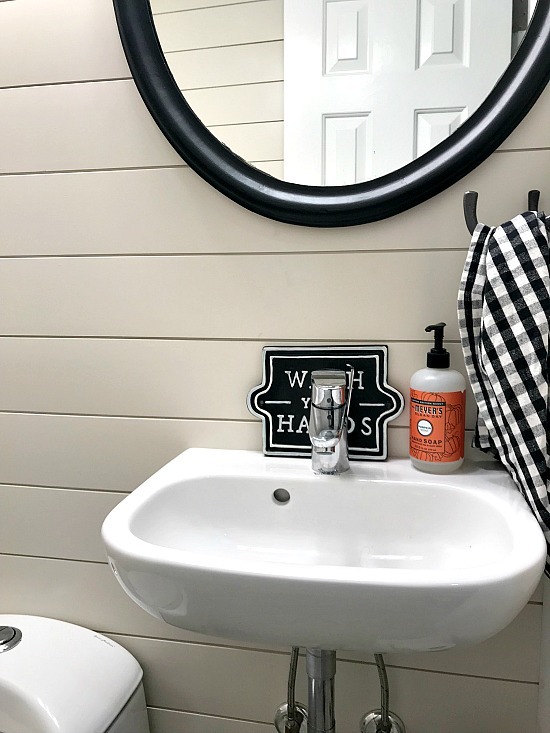 It is a tiny sink but all you really need to do is wash your hands in it so the tiny size was perfect for this small space. This simple faucet is a Hansgrohe and was the perfect size for the sink. It was also ordered from Amazon. The mirror is a large vintage oval mirror I found at a garage sale and painted black. All that was left for me to do were to choose the accessories. I went with a simple black toilet paper holder and a three hook swivel towel holder. The very cute metal wash your hands sign came from Target. The best way I can share this beautiful new tiny bathroom is by taking a video. so we can send our latest DIY project right to you!